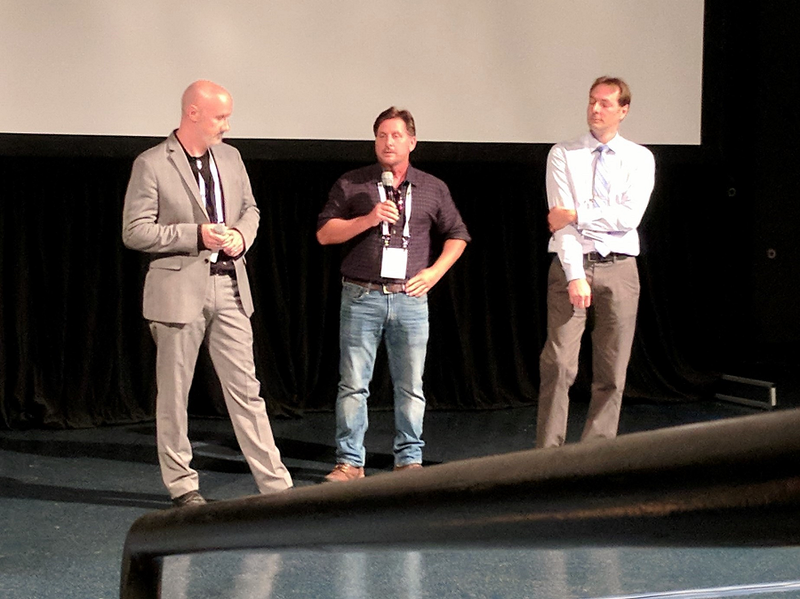 As I explain at the beginning of my coverage of ALA’s 2018 Annual Conference, my first official ALA action was going to a screening of Emilio Estevez’s recently finished movie called the public (yes, the title uses lowercase letters). It was a moving experience. Here’s the storyline: It’s winter in Ohio, and there’s a brutal cold spell. Homeless shelters are full, and some people who sleep outside have died. There’s a group of homeless men (and one feisty woman) who regularly use the library, and one night they decide they should be able to sleep there because it’s dangerously cold outside. Of course, staff members try to shoo them out at closing time, but the group stages a sit-in. Library administrators and law enforcement officials (Christian Slater, Alec Baldwin) get involved. The rest of the story unfolds over the freezing night as everyone grapples with following the rule of law versus practicing humanitarianism. ALA’s conference program had explained that, after the movie, writer/director/actor/activist Estevez would take part in a discussion. The other guest was Chris Rice, marketing team manager at the Public Library of Cincinnati and Hamilton County (PLCHC), where the movie was filmed. Ryan J. Dowd, author of a recent book called The Librarian’s Guide to Homelessness, was on hand to moderate the discussion. As you might imagine, the crowd of librarians who watched the public erupted in thunderous applause when it was over. Dowd and Estevez appeared on the stage to make some remarks before opening for questions. Estevez confirmed his admiration for library workers by stating, “You are what democracy looks like” (cue more applause). He explained his inspiration for the film: He had spent quite some time in the Los Angeles Public Library doing research for a previous film, Bobby (about Robert Kennedy). After-ward, he read an article about the challenges of having many homeless and/or mentally ill patrons in LAPL, and he wanted to tell a story based on that. The caring star talked openly about why he was driven to make such an unusual film. Estevez confirmed that he got his activist streak from his father, actor Martin Sheen, who Estevez said has been arrested 68 times for protesting social issues (homelessness, anti-immigration policies, and nuclear weapons testing). Estevez told the audience his goal is “to put you guys in a mask and cape and have you defend democracy,” just as he sees them do in real life. He plans to continue advocating for libraries too. Estevez revealed that he’s spent more than a decade on this project, consulting with “quite a few” librarians and doing “months of observation” in libraries, actually donning a “hood and glasses, trying not to be recognized.” He also shadowed some librarians, and even Googled “crazy questions librarians hear” so he could use real reference queries in the film. He wrote a 155-page script, which he had to whittle down to 117 pages so the movie wouldn’t go longer than 2 hours. Finally, he shot the film at PLCHC in just 22 days, working mostly overnight when the library was closed in order to disturb its functions as little as possible. I had a perfect center-screen seat for the movie. Interestingly, during the post-film Q&A in New Orleans, an audience member asked PLCHC’s Rice about the potential for problems following the movie’s release. “I don’t really expect any backlash,” Rice responded, explaining that Cincinnati’s residents know there’s a large homeless population and that the library has a good relationship with homeless advocates. He expects residents of the Queen City to understand this reality. I, however, am more concerned about the rest of the country. Maybe this film will help start a new conversation about America’s challenges with homelessness. Perhaps it will help public libraries by putting them in the spotlight. But it could also fuel some conflict between library employees and misinformed citizens who are, shall we say, less than philanthropic. Get ready to discuss how funding works. How much local tax money does your library system receive? How much money does it get annually per every $100,000 of property taxes paid? What state and federal funding comes your way? Do you apply for grants? Familiarize yourself with your policies so you can discuss them. What’s your policy on homeless people in your library? Exactly how can other patrons report problems they have with vagrants in or around your building? What rights do homeless individuals have? How can concerned citizens help? Are there local or regional charities they can contribute to? What books can they read; what blogs can they follow in order to understand the situation better? Which community organizations can they join? Should your library system convene a panel discussion or host any programs to help citizens learn about, and comment on, the situation in your town or county? This brings up a broader question: Do you have a crisis communications plan? What will you do if someone writes a letter to the editor (or posts on social media) about how an encounter with a homeless or mentally ill library user ruined his or her own library visit? What if someone says he or she feels threatened by marginalized people hanging out there? Are you ready to respond? 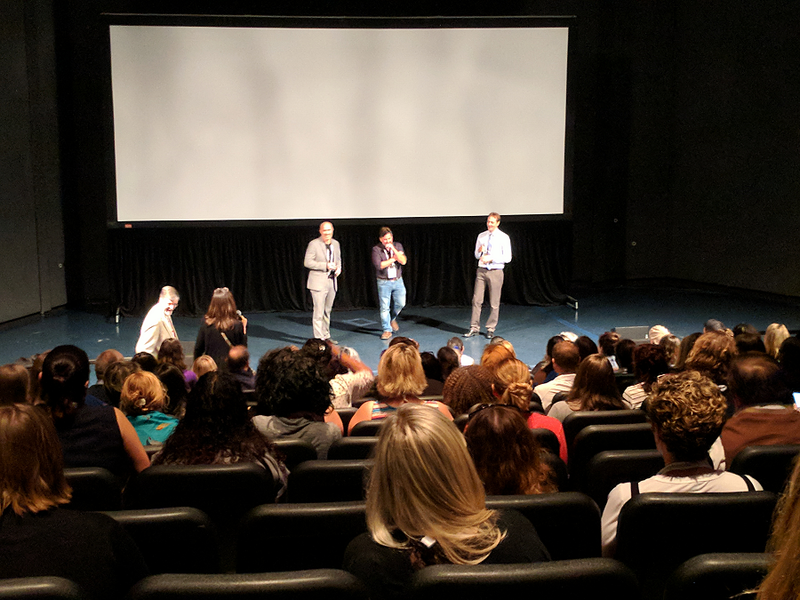 After the film, author Ryan J. Dowd (left), actor/director/writer Emilio Estevez, and PLCHC staffer Chris Rice held an hour-long Q&A session with the audience. Do you have a Donation link on your website that’s easy to find and simple to use? Would you like to start a fundraising campaign, either alone or in concert with groups that assist marginalized people? What about having a food drive or a Food for Fines event? Is it time to consider hiring a part-time social worker based in your library to approach and assist people who need help? Could you raise funds or find a grant for that? At ALA in late June, the film didn’t have a set distribution plan. Estevez said he’d like to see it screened in many cities and in libraries as well as theaters. He’s also hoping for a general release. In addition, the star revealed that he’d love for his film to function as a “back-door pilot” for an eventual series on Netflix or Amazon. A July 5 article in The Beacon-News mentions “the November release,” but I was unable to confirm that (www.chicagotribune.com/sub urbs/aurora-beacon-news/opinion/ct-abn-crosby-dowd-estevez-st-0706-story.html). While dealing with homeless people in and around libraries has been a topic of conversation before, this film (especially if it grows into a series) will likely renew that discussion. If your organization is not already prepared to participate, I suggest you start working on it now. I’ve gathered some resources to help. Check the sidebar [below] for links. “Sno-Isle Curates Community Conversations,” by Charles Pratt and Sonia Gustafson. Marketing Library Services , July/August 2017. Kathy Dempsey is a marketing consultant at Libraries Are Essential (www.LibrariesAreEssential.com) and the author of The Accidental Library Marketer. She’s been the editor of MLS for 24 years. Her email address is kdempsey@infotoday.com.